Samoa is a postcard of natural beauty consisting of ten islands, each offering very distinct and different environments to explore. From the rainforest covered rugged volcanic mountain peaks of the two main islands to the vast valleys leading down to a coastline ringed with a necklace of white sandy beaches. Within these lush green fertile valleys, grow banyan trees towering above the rainforest canopy which is full of tropical blooms and numerous varieties of vegetation. Cascading waterfalls dropping into rivers that cut jagged lines through the valley floor as they make their way to the ocean. The coastline is a wonder in itself, with sparkling white sand beaches, in some places stretching for miles, and here and there are walls of sheer cliffs that drop straight into the Pacific. And beyond the beaches out into the blue lagoons are scattered the rest of the islands that make up the Samoa archipelago, some inhabited, others with only natures wildlife, protected by the fringing coral reef that keep the powerful force of the Pacific Ocean at bay. And amongst all this natural beauty and picturesque valleys and coastline you will find nu€™u or villages with their churches, meeting houses and open fale or homes encircling the malae or village green. Home to people proud of their strong Fa€™a Samoa - cultural heritage, that live along side these natural wonders. For it's the people, culture and nature that give life to these islands. Along with the natural beauties and beautiful Samoan people, Your trip to Samoa wouldnt be complete without catching some epic waves along all coastlines of the country. Maninoa Surf Fales situated on the South Side of Apia (Capital) on Upolu Island! Is a place surfers dream about and one day dream of coming to! Only a short trip from Australia, Samoa is the perfect holiday idea for Families, Couples and Singles to indulge in pure beauty and some ultimate surfing time in the water! Maninoa Surf Fales is the longest estabilished surf camp in Samoa, and with this notable tag to our name we are happy to bring surfers from all over the world of all levels for a very cost effective trip, a trip were a surfer can get value for money! Maninoa's experienced Surf Guide of 8 years (Tim Southall) will take you daily to our world class breaks nearby. 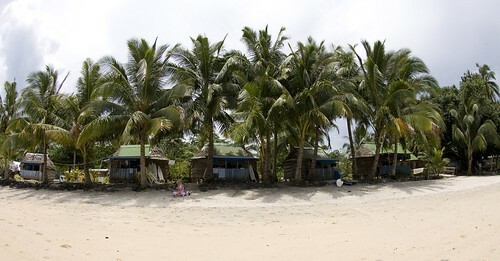 Maninoas private secluded beach offers guests snorkelling, kayaking, fishing and a games room. Other services such as Diving, Golf and Tennis are also available on request! Why not check out a traditional fire dance celebration also while in Samoa? 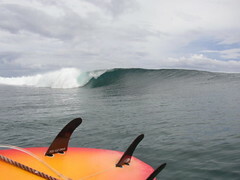 The Surf in Samoa is world class! and with so many Lefts and Rights to choose from you may find yourself stuffed for choice! but it is certain you will get the wave of your life if not more while in Samoa. The waves are'nt as powerful as those in the Mentawaiis or Bali but still pick up large swells coming from the Pacific Ocean, which also means warm waters! They still pack some punch on big days and are only suitable for Intermediate - Advanced level surfers. If big waves arn't really your thing, then there are plenty of breaks around that dont pick up as much swell and will always be a bit smaller than the swell magnets. Packages to Maninoa Surf Fales, Samoa start from AUD$1,695 including flights departing all states in Aust, Breakfast and Dinner, Accommodation, Airport Transfers and all surfing transfers!!! To Book your Samoan Holiday with Line Up Surf click here NOW!